The idea that people who live in our rich, affluent society can be deficient in vitamins and minerals is still heresy to a few doctors, but nutritional deficiencies occur, and supplements can help fix them. This chapter looks at some of the vitamins and minerals that may be depleted in people with diabetes, some relevant research, and precautions if any are advised. Vitamin and mineral deficiencies can spring from chronic illnesses like diabetes, stress, poor nutrition, smoking, depression, medications, over-consumption of diuretics such as soft drinks and coffee, and poor absorption of nutrients. Dieters are at great risk, particularly those consuming less than 1,200 calories per day. Older people often have trouble absorbing nutrients. Smokers and vegetarians can have vitamin deficiencies. Some diabetes medications deplete the body of nutrients such as folic acid and magnesium, and medications for other conditions can also impact nutritional status. Deficiencies, marginal deficiencies, or imbalances in ratios between certain vitamins and minerals can weaken the body and cause additional health problems. People with diabetes who have high blood sugar urinate more often than usual. When blood sugar levels top approximately 160 mg./dl., the kidneys lose their ability to reabsorb glucose and water soluble nutrients, and the excretion of sugar, vitamins, and minerals begins. Water soluble vitamins such as B1, B6, B12, and C, as well as minerals such as chromium, magnesium, and zinc, can all be lost. Vitamin and mineral supplements are still controversial. Some doctors scorn them, while other doctors recommend a few key supplements routinely, or after relevant tests. The American Diabetes Association does not endorse the use of supplements, citing only "theoretical reasons" for their use. All people with diabetes certainly need the recommended daily levels of major vitamins and minerals, and some need more. Good tests of nutritional status are available. If you are low, supplements may be recommended. If your nutritional status is extraordinarily poor, intravenous vitamins and minerals may be advised. 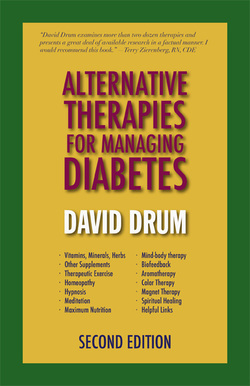 Many herbs included in this chapter may be helpful for people with diabetes. Herbal medicines made from plants have been used in treating diabetes for centuries, and more than 400 traditional plant treatments or folk remedies for diabetes mellitus have been recorded. The oldest surviving herbal medicines have stood the test of time, with research that documents their efficacy. Nutritionally oriented doctors, and practitioners of naturopathy, traditional Chinese medicine, and Ayurvedic medicine, and other herbalists, sometimes use herbs to treat diabetes. These practitioners often use different herbs, in different ways. Western herbal medicine uses herbs more or less as medicines: one herbal preparation is usually selected to treat a particular complaint on a short-term basis. In Asia, combinations of herbs are often used for broad-spectrum effects. Herbal treatments may take effect slowly, but usually show benefit within one to three months. In European countries such as Germany, physicians are required to study the use of herbs as part of their medical training. In North America, nutritionally oriented physicians, naturopaths, Ayurvedic practitioners, herbalists, and other practitioners can be consulted for a comprehensive treatment plan involving herbs. Two of the best sources of information on medicinal herbs are The Complete German Commission E Monographs, an extensive and scientific review of particular herbs conducted by the German government, and The Lawrence Review of Natural Products, a reference book published in the United States. Perhaps one-fourth of all pharmacological drugs have been produced from the active ingredients in herbs. This includes the diabetes medication metformin, which utilizes the active ingredient in French lilac or goat's rue, an old European folk remedy for diabetes. In 1879, a Prussian military officer returned from the Franco-Prussian war to find that his beloved wife had been unfaithful to him during his absence. The officer developed diabetes within a few days, according to Henry Maudsley, a doctor who was one of the founders of modern psychiatry. This is one of several incidents of diabetes being diagnosed after a time of great emotional stress documented in medical literature. Certainly, stress can trigger the onset of Type 2 diabetes. It can also be a crucial factor in how quickly diabetes progresses. Chronic, negative stress grinds away at the body, the mind, the emotions, and the spirit. In our hyperactive, achievement-oriented society, every person alive has times of feeling stressed-out. Stress is ubiquitous in our society. It may be physical, mental, or even emotional. While certain people seem to thrive on certain types of stress, chronic negative stress is quite harmful to your health. Some doctors believe that stress is the root cause of all disease. Stress is one of the more expansive concepts in Western medicine, which is generally reductionistic in its search for symptoms and root causes of disease. Stress may be compared with the grand Eastern concepts of prana or chi. More than 2,000 years ago the Greek physician Hippocrates defined "health" as mind and body in harmony. Hippocrates defined "disease" as mind and body out of harmony. Dr. Hans Selye, the father of stress medicine, summed up this line of thought when he stated: "Life is stress and stress is life." Certainly we live in stressful times. Many studies have shown that modern life is becoming more and more stressful. Driven by unstoppable technological advances, like cellular phones, computers, fax machines, and E-mail, the pace of life itself seems to be accelerating. A well-known survey of life's most stressful events, first taken more than thirty years ago, was repeated in 1997. The authors concluded that American life had become 45 percent more stressful in the past three decades. Hypnotherapy probably began with the mesmerizing gaze of the shaman. Hypnosis as we know it was invented and popularized in the 18th century by the charismatic European physician Franz Mesmer, who is considered the father of medical hypnosis. William James, Sigmund Freud, and Milton Erikson studied hypnosis, which was recognized as a valid treatment in 1958 by the American Medical Association. Mind/body therapies such as hypnosis, autogenic training, or even reciting affirmations may deeply relax you and help you manage diabetes. Like other mind/body therapies, hypnosis provides greater stability of heart rate and blood pressure and other functions controlled by the autonomic nervous system. Brain waves slow when you are under hypnosis. Hypnosis may help stabilize blood sugar, the most crucial marker of diabetic control. Hypnotherapy can be useful in relaxing the mind and body, and in confronting emotional issues such as fear and anger, which can stand in the way of good self-management, attempts to lose weight, and optimum mental health. Insights generated during hypnosis can help reduce depression, fear, and anxiety, and lead to a positive acceptance of the disease. Hypnosis can help people overcome highly personal obstacles to keeping themselves healthy. Hypnosis can help you deal with bad habits such as smoking. Self-hypnosis can provide an enhanced sense of personal control. In China, the land of its inception, acupuncture is sometimes used as a primary treatment for diabetes. However, research in China shows that acupuncture is most effective when used as a complementary treatment along with diet, exercise, and medications. Acupuncture was once used only as a pain treatment of last resort in the United States, but it is being utilized earlier now, with greater success. The World Health Organization recently added peripheral neuropathy to its list of diseases that respond well to acupuncture. Research in China shows that acupuncture treatment may lower blood sugar and blood pressure, perhaps by strengthening and rebalancing energy patterns in the body. It can be a useful treatment for anxiety or depression. Acupuncture beefs up the immune system and minimizes the chances for complications involving blood circulation. Acupuncture has also been effective as an aid in weight loss programs, if these are caused by food addictions. Acupuncture is only one aspect of traditional Chinese medicine, but it is the part most frequently practiced in the West. Treatment involves fine needles gently tapped into one or several acupoints on the skin of the body, ear, or hand. The 360 acupoints lie along 14 invisible energy pathways or circuits called meridians, about a dozen of which are believed to be tied into specific organs. These meridians are held to be channels for the ubiquitous life energy called chi, the invisible surging force of the universe believed to animate the body. In good health, according to Chinese theory, each person retains just the right amount of chi energy, balanced between its positive and negative forms, yang and yin. A shortage, excess, or imbalance of chi in parts of the body is said to result in diseases like diabetes. Homeopathy, a gentle, energy-based medical treatment popular in the United States at the turn of the century, is regaining popularity. People as diverse as John D. Rockefeller, Henry James, and Mahatma Gandhi have been believers in homeopathic medicine. For several generations, Britain's royal family has been attended by homeopathic physicians. Approximately 3,000 health professionals practice homeopathy in the United States, including many who are medical doctors. At the moment, homeopathy is more frequently used in Europe and India than in this country. Homeopathy cannot cure diabetes, but it can greatly fortify the health of the person who has it. The greatest danger of homeopathic treatment, or any alternative therapy, is that it may delay the use of an effective conventional treatment. For this reason, people with diabetes are strongly advised to consult homeopathic practitioners who are also medical doctors or doctors of osteopathic medicine. These practitioners are most likely to understand the management of diabetes and to refer to other practitioners as necessary. "You have to realize what Type 2 diabetes is," says Dr. Allen Neiswander, D.Ht., of Alhambra, California. "Exercise and diet are very important. You can use homeopathic remedies, and you can also use insulin and other medications." Dr. Neiswander, a distinguished medical doctor who was born into a family of homeopaths, has been practicing medicine and homeopathy for more than fifty years. The full color spectrum of natural light, even in its invisible ultraviolet frequencies, may be beneficial to your overall health. Ultraviolet light helps lower blood pressure and has many other health benefits. Light therapies may relieve stress or help treat particular ailments such as depression. Using the vibrant visible color spectrum of light, color therapists also employ color to enhance healing.